The 1901 all-Ireland census was taken on Sunday 31 March. Each head of household across the island had to fill in a form (Form A) while the enumerator filled in three additional forms. 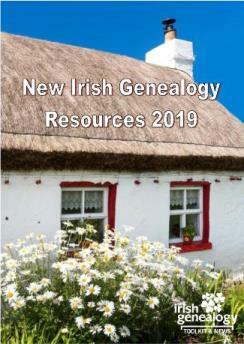 It is the earliest Irish census to have survived in its entirety and is, therefore, hugely important to genealogists. Statistics show that Dublin and Belfast had similar sized populations of 350,343 and 349,180 respectively. Cork was the third largest city with 76,122 souls. At this time in Dublin, over a third of the population of 350,343 was living in one-room dwellings in Georgian tenement houses, usually with five or six families per house. There was no running water supply. In newly built terraced houses and villas in the city it was becoming less unusual, but by no means typical, to have piped water and flushing toilets. 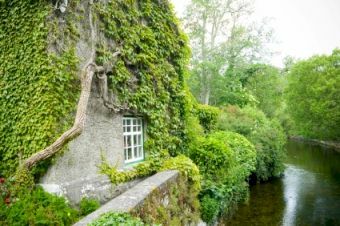 In rural areas, such luxuries were extremely rare, although standards had improved in the previous half century with the thatched mud cabin now largely replaced by stone walled cottages. According to one report of a street in County Tipperary in 1901, a single earth-closet served 36 families. Click image to download a blank 1901 census form. Save yourself some printer ink! Instead of printing off the on-screen images of the returns, you may find it useful to have a supply of blank forms on which to transcribe details of your family. 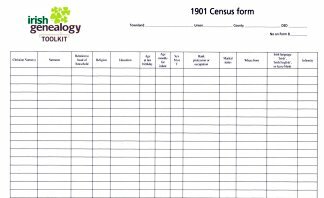 Tap image to download free blank 1901 census form. All the returns for the 1901 census are now fully indexed and available to search and view free of charge on the website of the National Archives of Ireland. ► Free census records for 1911 are also online. Find out more. 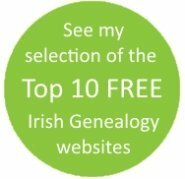 ► See if any fragments of older Irish census records might help your genealogy research.